DigiTour is a most advanced multimedia guide application for mobile devices with touch technology, which opens up your collection in an exciting new way. DigiTour combines audio information with graphically rich, interactive content. Pictures and videos help your visitors understand the works in your collection. 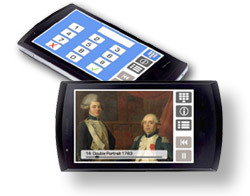 Modern touch screen technology makes DigiTour an easy to use mobile museum guide, providing information where visitors need it – in front of the viewed museum object. For young visitors, we develop special tours that transform a museum visit into an exciting scavenger hunt. Every object tells its individual story that invites the young viewer to have a closer look and learn about art and cultural backgrounds. And sometimes amiable cartoon characters explain complex things in funny, easy ways. We know that carefully produced high-quality content is of vital importance to ensure an enchanting and authoritative guided tour through any collection. Thus we put great effort into transforming written texts into meaningful audio and video content. To this end, we integrate professional male and female voices with music and sound effects to achieve an informative, touching content which delights museum visitors. We create strong solutions in museum communications to fit your style and your budget. Download our brochure 2011 (PDF 0,3 MB) to learn more about DigiTour.